VARIETY OF: Quartz , SiO2 , Silicon Dioxide. COLOR: various shades of white, usually milky. Milky Quartz is any quartz crystal or cluster that is white in color and cloudy. The cloudy white character of the crystals is what lead to the variety name, milky. The cloudiness of milky quartz comes from microscopic inclusions of fluids that have been encased in the crystal from the time the crystal first grew. From a cynical point of view the inclusions have ruined the crystal from being used for the many purposes that quartz crystals are tasked to do (e.g. gemstones or optic purposes). However, milky quartz is used in many fine ornamental carvings and the fluid inclusions can give milky quartz a attractive greasy luster unlike the other varieties of quartz. Milky quartz is often responsible for the cloudy phantoms inside of otherwise clear rock quartz, amethyst, citrine or smoky quartz. The milky quartz may have formed at an early stage of the crystal's growth and a later stage of clear quartz growth covered the milky quartz. The effect results in seemingly a crystal within a crystal and the interior crystal may have a ghostly look, hence the name phantom. The milky quartz-amethyst phantom combination results in an ornamental stone called chevron amethyst. The bands of amethyst and milky quartz make thin well defined chevrons of purple and white that are attractive as polished stones and in ornamental carvings. Milky quartz is occasionally associated with gold in hydrothermal veins. Prospectors searching for gold laden ore, look for outcrops of milky white quartz veins. Many of the most beautiful gold specimens are the ones that have the lacy gold extruding from the pure white milky quartz. 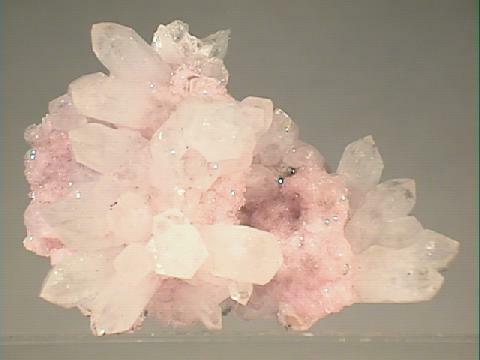 Other attractive associations with milky quartz include those with rhodochrosite (pictured above), fluorite, calcite, galena, pyrite, elbaite, micas and many many others. Prasiolite is a leek-green gemstone variety that is rare in nature but is created by heating Amethyst from certain locations. Agate is a general term for several microscopic quartz varieties. Copyright ©1995-2008 by Amethyst Galleries, Inc.